Plus, it's pretty easy to use! The first time I used a spiralizer — one of those gadgets that turn veggies into "noodles" — I'm pretty sure I looked like one of those overly dramatic, frustrated cooks on an infomercial. Squash quickly clogged the cheap $10 model I bought, and I gave up. 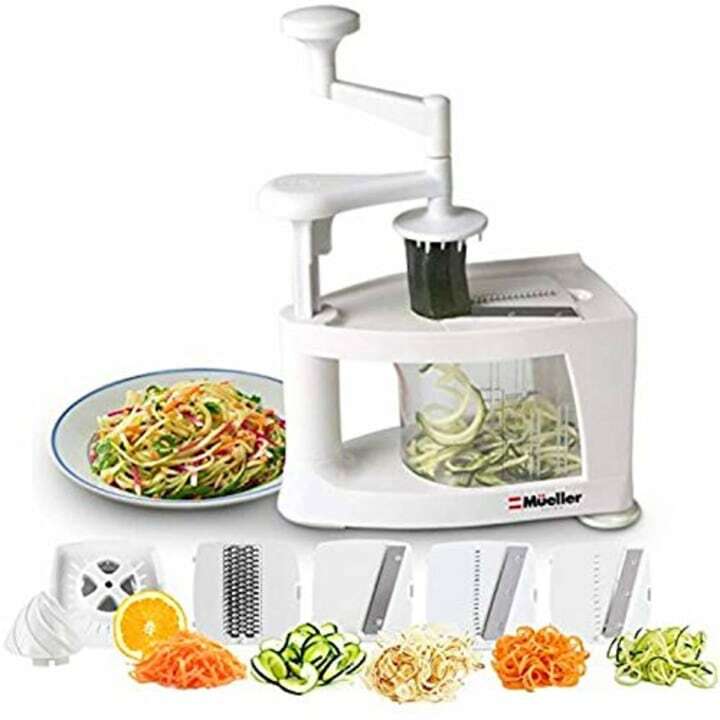 Luckily, after loads of research, I found a gadget that easily turns out long, uniform veggie noodles: the Mueller Multi-Blade Spiralizer, which goes for a pretty reasonable $24 on Amazon. It also has over 4,000 reviews and is a best seller on the site. Admittedly, when I first pulled it out of the box, I was a bit intimidated. But it's simple enough: The spiralizer includes a plastic base with suction-cup feet, a clear bin that collects the "noodles," and a handle-crank that has teeth to hold the veggie in place, sparing your fingertips. It comes with four blades — a thicker and thinner julienne cut (those are the ones you'll use for "noodles"), a grater and mandoline — plus a juicer. 1. It's easy to use. Here's what you do: Cut your veggie into roughly four-inch sections, if needed. Place one end of the veggie, vertically, into the "teeth" of the veggie holder (under the hand crank) and lower the crank so that the veggie meets the blade. (Make sure the blade is inserted in the sideways orientation, if you're making veggie noodles.) Then, turn the crank and let the "noodles" fall into the four-cup bin below. 2. It turns out the long, uniform veggies noodles of our dreams. During the period of time in which I gave up on spiralizer gadgets, I used a julienne peeler, trying to convince myself that my relatively short, sloppily grated "noodles" were just fine. Well, once I compared this spiralizer to a julienne peeler (below), I decided there was no going back — these looked like Instagram noodles! 3. It's fairly easy to clean. The veggies don't make much of a mess, so cleanup isn't terrible. Pop out the blade and veggie bin (hand wash or top-rack dishwasher safe); then wipe the plastic base clean. The one bummer is that, with all the attachments, storage is tricky, but I'd recommend keeping it assembled, with the accessories nearby in a zip-top bag. Reviewers online agree that the vertical design makes the spiralizer easier to use than most ("Gravity is my friend," one noted). Another said, "It continues to be the best of the bunch, by a wide margin." Perhaps the biggest miracle of all: "I even got the kids to eat zoodles." For more product reviews, check out this article on our favorite Dutch oven (that's insanely affordable! ), this one on our review of Kristen Bell's favorite chickpea pasta and the reason one editor loves using this gadget to make coffee at his desk. This article was originally published on December 12, 2017 on TODAY.com.